Ever meet one of those amazing people with a photographic memory? An almost frightening recall of facts and figures, places and dates? Ready to launch into a detailed reconstruction of events long past at the drop of a hat? 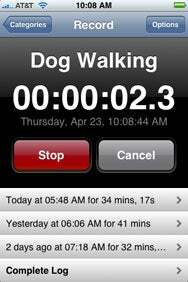 Time for Timer: TimeJot provides multiple stopwatch-style counters to track time-based activities like exercise, or pet-walking. A comprehensive log of past efforts complements the current timer. Few of us are gifted with such detailed, laser-like recall of events, but now, with TimeJot, we can all be rescued from our hazy memories. Niftybrick Software’s $1 app offers a unique time-based journal to help track the duration of activities, as well as capturing important-but-easily-forgotten events, like taking medication. TimeJot is built on the notion of categories which reflect activities to be tracked. You simply name the category, and indicate whether TimeJot should record the duration of events. Recording the duration allows you to easily track how much time you spend engaged in an activity—walking the dog, working out at the gym, and the like. To begin tracking, simply select the appropriate category and press the start button. TimeJot kicks off a stopwatch which records, to the hundredth of a second, your devotion to a task. When you’ve finished, press stop to prompt the application to record the date and time you began and how much time you devoted to the effort. For categories where duration isn’t being tracked, TimeJot simply captures the time of the event. Like a traditional journal, each record provides a space for notes. You can edit individual records, adding or deleting entries at will. TimeJot tracks more than one event at a time, and a badge on the application icon reveals how many timers are running. The application saves clock values when closed, so taking or making a call or starting another application won’t cause you to lose track of your timers. Sharing of information is accomplished via the device’s Mail application. All the information for a category—including notes—is added to the e-mail as text, which you can annotate as desired. It would be nice if TimeJot offered you the ability to share data in a more structured format, such as CSV or XML. That would make it easier for those tracking long-term efforts, such as athletic training, to import the data into a spreadsheet or database.